CFA Collected Newsletters 2011-2015 CD NEW in 2016! Special Offer! All three Newsletter CDs for a reduced price! Non-member prices for items below include a one year complimentary membership in The Chandler Family Association and three issues of The Chandler Family Association Newsletter . If you order more than one item , you should only pay the non-member price once and then pay the member’s price for additional items. Non-acceptance of membership will have no effect on the cost of your item(s). Prices include shipping. The award-winning Chandler Family Association Newsletter is published 3 times yearly. Each 20-page issue generally includes a mixture of serious genealogical articles and some general interest articles. CFA members are invited to submit articles for the Newsletter . 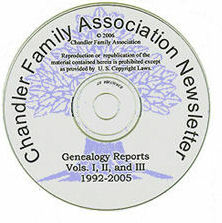 The newsletters are available only through membership in the Chandler Family Association. Membership information is available here: membership.html. 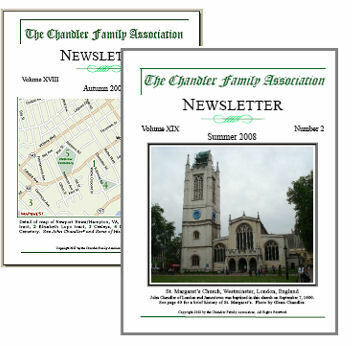 Receive or Send Complimentary Issue of Newsletter If you are or know of a prospective member of The Chandler Family Association who would like to receive one complimentary issue of our Newsletter , please contact Claudia at . The newsletter will be a PDF file. If you need more information about PDF files, contact Claudia. CFA member price for the CFA Newsletter CD is $12, shipping and handling included. 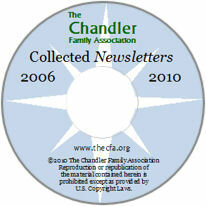 Non-member price for the CFA Collected Newsletter 2006-2010 CD is $15. This price includes shipping and handling, plus a complimentary one-year membership in the Chandler Family Association with a copy of each of the next three newsletters. International shipping prices: $15 for members, $20 for non-members (includes one year complimentary membership). The issues are presented as PDF files, requiring Adobe Reader* to view, and are fully searchable. You can actually search all three volumes at once and view a hyperlinked list of results. You may print all the articles if you like or only a specific section or page. The CFA Newsletter CD would make a perfect gift for any Chandler family member. CFA member price for the CFA Newsletter 1992-2005 CD is $12, shipping and handling included. Non-member price for the CFA Newsletter 1992-2005 CD is $15. This price includes shipping and handling, plus a complimentary one-year membership in the Chandler Family Association with a copy of each of the next three newsletters. Special Offer! All three Newsletter CDs above for one reduced priced! CFA member price for all three CDs is $30, shipping and handling included. Non-member price for all three CDs is $40. This price includes shipping and handling, plus a complimentary one-year membership in the Chandler Family Association with a copy of each of the next three newsletters. International price, including shipping, for all three CDs: $40 for members, $55 for non-members (includes one year complimentary membership). This booklet was originally produced by the Federation of Family History Societies (FFHS), based in England and was designed to interest our young people in family history. The CFA is a member of the FFHS and has permission to reproduce the booklet for our members. You may download the booklet as a PDF (see printing cautions below) or request a printed copy from the CFA. The 5-1/2″ x 8-1/2″ booklet has 26 interior pages where you can add your family information and includes a blank family tree. 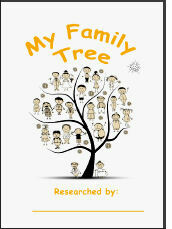 You can order a printed copy of the My Family Tree booklet from the CFA. The booklet is free to CFA members upon request; non-members will pay only the cost of publication plus postage – $2.50 ($3.50 for international mail). Members may request a copy by writing to . Non-members may choose to order online or by mail at this top of this page.